In 2014 we funded an exciting new collaborative project. The RP Genome Project brought together the four largest research groups in the UK specialising in inherited retinal diseases (IRDs): The University of Leeds, London’s UCL Institute of Ophthalmology, Manchester Royal Eye Hospital and Oxford University Eye Hospital. It was the first project of its kind in terms of the level of collaborative working required for its success. Since then, three further sites have been added to the study, widening the scope for collaboration and the availability of data and resources. The new sites are University Hospitals Bristol NHS Foundation Trust, Cardiff and Vale University Local Health Board (University Hospital Wales) and University Hospital Southampton. 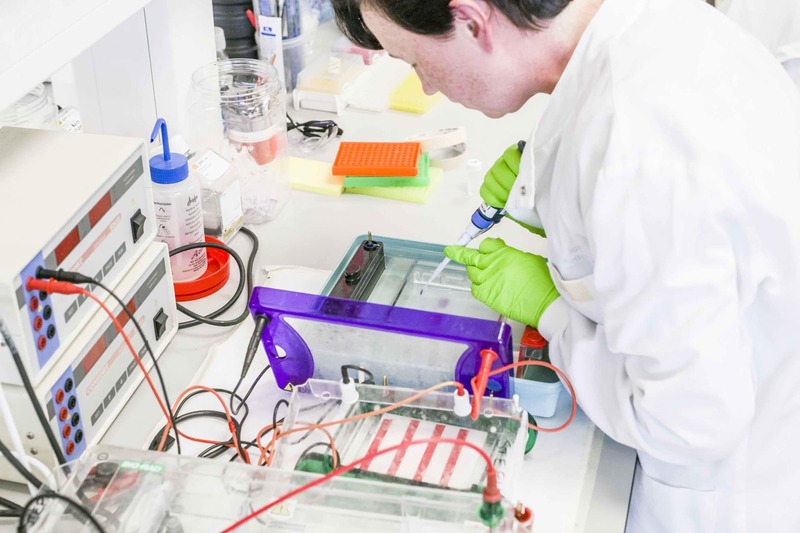 The RP Genome Project is particularly important for people with an inherited retinal dystrophy who do not have a specific diagnosis or who can’t yet be given a clear idea of how their condition might develop. Discovering new genes will also make it possible to start developing treatments. The consortium has joined the Genetics England Clinical Interpretation Partnership (GECIP), associated with the UK 100,000 Genome Project. One of the consortium investigators has been chosen to lead the GECIP in the field of ophthalmology and will be able to ensure that the genetics of IRDs are well represented among the 100,000 genomes being sampled. The team has significantly increased available capacity for storing, sharing and analysing data (specifically whole genome data) by investing in the IT infrastructure required. This is vital for a project that is so heavily focused on the collection and analysis of data and collaboration between multiple sites. Five new disease causing genes have been identified, with more than ten further candidates under investigation. These discoveries will be vital in furthering our understanding of the root genetic causes of IRDs. By analysing the patient samples available, the team has been able to find the genetic basis for disease in more than 230 cases. Discovering which gene is responsible for any given patient’s IRD will allow clinicians to quickly identify the nature of their condition and, in the longer term, select appropriate treatment options. Several Strategic and Advisory Committee meetings have been held. The committee includes several patient representatives, who are supporting the development of the project. Retina UK was founded by people with RP and remains a patient focused organisation. The aim of the committee is to ensure that patients can monitor progress, disseminate information, hold the consortium to account, and exert influence where appropriate. Seventeen papers have been published by the consortium to date, communicating their findings to the wider scientific community in order to share the latest developments, avoid duplication of work and drive progress forward. A further thirteen are in the proposal stages. Continued to identify new patients for inclusion with the number of consented participants now in excess of 200. Sent 375 DNA samples for exome and 40 samples for genome analysis. Received data back for 346 samples and completed analysis. Initiated segregation studies in some families (recruited some participants for phenotypic data only with no sampling). Continued to identify multiple candidate disease causing genes and numerous mutations on known genes. The progress that the consortium has made in terms of the gathering, analysis and sharing of data has been impressive, and their position as part of the GECIP will keep IRDs on the national agenda at a crucial time for RP research. Importantly, their work has also led to discoveries that would not have been possible without this project, advancing our knowledge of RP and informing the development of future treatments for those facing visual impairment. The project is running until September 2018, and the consortium is currently pursuing continuation funding in order to continue this ground-breaking work. We are very grateful to everyone who has supported this important project, including Fight for Sight. Make a donation to help us continue funding ground-breaking research.